Jeffrey Earnhardt (born June 22, 1989) is an American professional stock car racing driver. He currently competes part-time in the NASCAR Sprint Cup Series, driving the No. 32 Ford Fusion for Go FAS Racing. Earnhardt is the middle child of Kerry Earnhardt, the grandson of Dale Earnhardt, great-grandson of Ralph Earnhardt and nephew of Dale Earnhardt Jr.
Earnhardt's first race came in the hornet division at Wythe Raceway in Rural Retreat, Virginia. He scored three feature wins and finished in the top-five in division points, winning rookie of the year. The following year he moved up to the sportsman division at the Motor Mile Speedway in Radford, Virginia, finishing the season in the top-10 of the division standings. He competed in the late model season finale at the track as a teammate to RCR developmental driver Allison Duncan. In 2006, General Motors created a driver developmental search program wherein they looked for individuals they believed to be the stars of the future and invited them to test a late model and a Busch car at two different tracks with the best moving on. Earnhardt made the final cut. In 2007, Earnhardt drove the No. 1 Chevrolet for Andy Santerre Motorsports in the NASCAR Busch East Series. He finished fifth in the 2007 Busch East point standings and won the Most Popular Driver Award at the end of the season. In 2008, Earnhardt returned to what is now known as the NASCAR K&N Pro Series East for another full season, along with selected Nationwide Series races. Earnhardt was unexpectedly replaced in the car at Dover in September 2008 with Aric Almirola who won the race. When DEI subsequently merged with Chip Ganassi Racing, their driver development program went into limbo, and Earnhardt was released. In 2010, Earnhardt drove several races with Rick Ware Racing which qualified him to drive on all NASCAR tracks in the 2011 season. He signed with RWR to drive a full season in 2011 and make his run for rookie of the year in the NASCAR Camping World Truck Series. However, he was originally released from the team after offering his driving services to other truck teams. Earnhardt and Ware later reconciled, citing a lack of communication from both parties. RWR ran Earnhardt in the 24 Hours of Daytona where they finished 12th. Earnhardt moved to the grand-am Rolex Sports Car Series in 2012, where he raced in the GT class for Rick Ware Racing. In November 2012, he announced he would be competing for rookie of the year in the NASCAR Nationwide Series in 2013, driving the No. 79 for Go Green Racing; sponsorship issues later limited his schedule with the team. On April 4, 2013, it was announced that Earnhardt would drive the No. 5 Chevrolet Camaro for JR Motorsports in the Nationwide race at Richmond International Raceway. In the 2013 Charlotte testing for Sprint Cup cars, Earnhardt tested a car for Go Green Racing. For 2014, Earnhardt moved full-time to the Nationwide Series, driving the No. 4 Chevrolet for JD Motorsports. During the Subway Firecracker 250 at Daytona, he was replaced by Matt DiBenedetto during the first caution period, since Earnhardt had suffered a fractured collarbone in a motorcycle accident during the week. He would then finish 18th in the point standings and was also released by JD Motorsports after his disappointing season. Before the 2015 season started, Earnhardt was picked up by Viva Motorsports to drive the season opener at Daytona. He finished 15th in the Daytona race. Earnhardt made his Sprint Cup Series debut at the 2015 Federated Auto Parts 400 at Richmond International Raceway for Go FAS Racing. On September 18, Go FAS announced Earnhardt would run the majority of the 2016 Sprint Cup Series season, except for restrictor plate races that Bobby Labonte will run and road course races that Boris Said will run, with sponsorship from Can-Am motorcycles. He will compete for Cup Rookie of the Year honors. Earnhardt joined BK Racing for the Hellmann's 500 at Talladega Superspeedway, driving the No. 83. He returned to BK for the AAA Texas 500, driving the No. 83 in place of an injured Matt DiBenedetto. After the 2016 season ended, Go FAS Racing announced that Earnhardt will not return to the 32 team next year. Earnhardt made his amateur debut in mixed martial arts on May 22, 2012, defeating Chris Faison by unanimous decision in Charlotte, North Carolina. ↑ Sorensen, Tom (December 30, 2012). "Kerry Earnhardt in his son Jeffrey's corner". The Charlotte Observer. Charlotte, NC. Retrieved 2013-01-01. ↑ Turner, Jared (September 17, 2006). "A family tradition". The Roanoke Times. Roanoke, VA. Retrieved 2013-08-18. ↑ Profile, nascarregionalracing.com; accessed June 29, 2015. 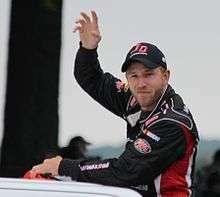 ↑ "NASCAR Jeffrey Earnhardt loses full-time Camping World Truck Series ride". Msn.foxsports.com. 2011-03-30. Retrieved 2014-03-17. ↑ Dagys, John (October 31, 2011). "GRAND-AM: Earnhardt, Rick Ware Aiming For GT Success". SPEED Channel. Charlotte, NC: Fox Sports. Retrieved 2011-10-31. ↑ "Jeffrey Earnhardt Tackles Bristol". SPEED Channel. Fox Sports. March 5, 2012. Retrieved 2012-03-06. ↑ Caldwell, Clayton (November 27, 2012). "Jeffrey Earnhardt Plans to Run Full-Time in NASCAR Nationwide Series with Go Green Racing". Motorsports 101. Retrieved 2012-12-22. ↑ Turnbull, Doug (February 22, 2013). "Stewart likes plate racing again and some words from the underdogs". WSB. Atlanta, GA. Retrieved 2013-02-23. ↑ "Jeffrey Earnhardt to made debut in JR Motorsports Chevy at Richmond later this month". Fox Sports. April 5, 2013. Retrieved 2013-04-11. ↑ "Larson leads fourth Charlotte configuration". NASCAR.com. 2013-12-11. Retrieved 2014-03-17. ↑ Estrada, Chris (January 10, 2014). "NNS: Jeffrey Earnhardt, Blake Koch land full-time rides". NBC Sports. Retrieved June 19, 2016. ↑ Eddinger, Mark (July 4, 2014). "Dakoda Armstrong Wins Pole as Downpour Causes 7-Car Crash in Round 1 of Nationwide Qualifying at Daytona". Sports Media 101. Retrieved 2014-07-04. ↑ McFadin, Daniel (August 27, 2015). "Jeffrey Earnhardt to make Sprint Cup debut at Richmond (VIDEO)". NBC Sports. Retrieved June 19, 2016. ↑ Rodgers, Joe (September 19, 2015). "Jeffrey Earnhardt, Bobby Labonte join forces with Ford for 2016 Cup season". Sporting News. Retrieved September 19, 2015. ↑ "JEFFREY EARNHARDT TO DRIVE FOR BK RACING AT TALLADEGA". NASCAR. October 17, 2016. Retrieved October 17, 2016. ↑ "Matt DiBenedetto out with concussion; Jeffrey Earnhardt called in as replacement". Sporting News. November 6, 2016. Retrieved November 6, 2016. ↑ "Jeffrey Earnhardt to make MMA debut in pay-per-view event at Charlotte". AutoWeek. May 21, 2012. Retrieved 2012-05-23. ↑ Larson, Mike (May 23, 2012). "NASCAR driver Jeffrey Earnhardt wins MMA debut in Charlotte". AutoWeek. Retrieved 2012-05-23. Wikimedia Commons has media related to Jeffrey Earnhardt.